easy workability for deep manipulation of skin and muscle.hypo-allergenic without a stronge fragrance.“PLEASE NOTE-Gallon Sizes are limited 4 gallons maximum per order in shipment, whether its 4 gallons of the same item or gallons of mixed products throughout the order.If you exceed the maximum of 4 gallons of the same item or mixed products per order, then the order will ship based upon weight of shipment and will have additional shipping charges that will not show up on your internet order but will be additional to your order and appear on your invoice recieved from us.This will overide our “free shipping policy over 99.00 and up. formulated specifically for relieving deep,knotted muscles or trigger points.nongreasy,unscented.“PLEASE NOTE-Gallon Sizes are limited 4 gallons maximum per order in shipment, whether its 4 gallons of the same item or gallons of mixed products throughout the order.If you exceed the maximum of 4 gallons of the same item or mixed products per order, then the order will ship based upon weight of shipment and will have additional shipping charges that will not show up on your internet order but will be additional to your order and appear on your invoice recieved from us.This will overide our “free shipping policy over 99.00 and up. Item#-UNI-ST236.Available in a gallon.Jojoba Herbal Massage Lotion offers your clients the very best in skin nutrition without the scent. Smooth and effortless to apply, this lotion is perfect for deep tissue work, reflexology or when you are looking for a little more absorption. Enhanced with Jojoba Oil, Arnica, Aloe, Herbal Infusions and vitamin E this lotion gives the massage therapist the perfect glide for the perfect massage. Unscented – Non Greasy – Water Dispersible – Washes From Sheets.PLEASE NOTE-Gallon Sizes are limited 4 gallons maximum per order in shipment, whether its 4 gallons of the same item or gallons of mixed products throughout the order.If you exceed the maximum of 4 gallons of the same item or mixed products per order, then the order will ship based upon weight of shipment and will have additional shipping charges that will not show up on your internet order but will be additional to your order and appear on your invoice recieved from us.This will overide our free shipping policy over 99.00 and up. Item#-UNI-ST245.Available in a gallon.Specially developed for the professional therapist, Lavender Herbal Massage Lotion gives you the absorbency you need without sacrificing the smooth, workable texture of a world-class cream. Light and silky to the touch, this luxurious lotion is perfectly balanced for deep tissue massage, neuromuscular massage, reflexology and all bodywork where additional control is required. Soothing Touch Lotion contains the deep moisturizing benefits of aloe vera, almond oil and vitamin E, combined with the calming herbal extracts of kava kava, St. John's Wart, valerian and pure essential lavender. 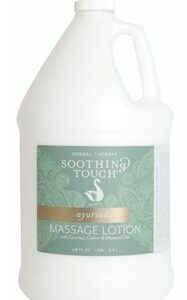 Soothing Touch Lotion gives you tactile flexibility and herbal nourishment for massage treatments that relax, replenish and rejuvenate.“PLEASE NOTE-Gallon Sizes are limited 4 gallons maximum per order in shipment, whether its 4 gallons of the same item or gallons of mixed products throughout the order.If you exceed the maximum of 4 gallons of the same item or mixed products per order, then the order will ship based upon weight of shipment and will have additional shipping charges that will not show up on your internet order but will be additional to your order and appear on your invoice recieved from us.This will overide our free shipping policy over 99.00 and up. Item#-UNI-ST328.Available in a gallon.This exotic moisturizing massage lotion will keep your body feeling rich and luscious throughout the day.““Pamper your skin and indulge your senses with the fresh, uplifting scent of Desert Blossom Massage Lotion. Created to stir the imagination, this exotic, moisturizing massage lotion will keep your body feeling rich and luscious throughout the day. Smooth and effortless to apply, this massage lotion is perfect for deep tissue work, reflexology or when you are looking for just a little more absorption. Experience the magic of true moisture with Desert Blossom Massage Lotion. Non Greasy – Water Dispersible.“PLEASE NOTE-Gallon Sizes are limited 4 gallons maximum per order in shipment, whether its 4 gallons of the same item or gallons of mixed products throughout the order.If you exceed the maximum of 4 gallons of the same item or mixed products per order, then the order will ship based upon weight of shipment and will have additional shipping charges that will not show up on your internet order but will be additional to your order and appear on your invoice recieved from us.This will overide our free shipping policy over 99.00 and up. Item#-UNI-ST353.Available in a gallon.This lotion is an excellent lubricant for many type of massage. Whether it is for Swedish, trigger point, sports, or deep tissue “massage, this deeply moisturizing massage lotion has the right glide and absorption rate for the therapist and the client. Its ayurvedic“components provide the balance needed for an ideal and rejuvenating massage.“Ayurveda is a system of holistic health remedies based on balancing the body.““Free Of“Parabens“Propylene Glycol“Formaldehydes“TEA, DEA & PEG“Phthalates“Synthetic Fragrance““This Natural Ayurvedic, Massage Lotion is made with a tridoshic (All Body Types) blend of Ayurvedic oils (Castor Oil, Coconut Oil and “Mustard Oil), to help balance the elements of the body.“PLEASE NOTE-Gallon Sizes are limited 4 gallons maximum per order in shipment, whether its 4 gallons of the same item or gallons of mixed products throughout the order.If you exceed the maximum of 4 gallons of the same item or mixed products per order, then the order will ship based upon weight of shipment and will have additional shipping charges that will not show up on your internet order but will be additional to your order and appear on your invoice recieved from us.This will overide our “free shipping policy over 99.00 and up. Item#-UNI-C6896T.Available in a gallon.Nutri-Naturals Massage Lotion has a lush, velvety texture, and is Biotoneâs longest-lasting lotion. Its light, garden-fresh scent renews and revitalizes as its rich emollients nourish and soften skin, gently sealing in moisture.““Ingredients: Purified Water, Coconut Oil Ester (Octyl Palmitate), Sunflower Oil (Helianthus annuus), Cold Pressed Avocado Oil (Persea americana), Cold Pressed Wheat Germ Oil (Triticum vulgare), Cold Pressed Jojoba Oil (Simmondsia chinensis), Carrot Oil (Daucus carota sativa), Vegetable Derived Emulsifying Wax, Extract of Avocado (Persea americana), Extract of Carrot (Daucus carota sativa), Vitamin E (mixed Tocopherol), Behenic Acid (vegetable softening agent), Glycine and Glycinates (amino acids), Grapeseed Extract (Vitis vinifera), Methyl/Propyl Paraben (traditional mild preservatives), Citric Acid (natural pH balancer), Dimethicone, Carbomer, Aromatic Extracts and Fragrance. Cruelty Free.PLEASE NOTE-Gallon Sizes are limited 4 gallons maximum per order in shipment, whether its 4 gallons of the same item or gallons of mixed products throughout the order.If you exceed the maximum of 4 gallons of the same item or mixed products per order, then the order will ship based upon weight of shipment and will have additional shipping charges that will not show up on your internet order but will be additional to your order and appear on your invoice recieved from us.This will overide our “free shipping policy over 99.00 and up. Item#-UNI-C6896T.Available in a gallon.Nutri-Naturals Massage Lotion combines skin healthy, vitamin rich ingredients to create a silky, emollient lotion that goes beyond basic moisturizing. Easy to apply and non-greasy, Nutri-Naturals Massage Lotion provides gentle friction, and the ideal glide, that leaves skin smooth and nourished. Blended with deep-moisturizing Avocado Oil, vitamin fortified Carrot Oil (Beta Carotene/Vitamin A), Wheat Germ Oil (Vitamin E), Vitamin C, healthy Sunflower Oil, and healing Jojoba Oil. Nutri-Naturals Creamy Massage Lotion is perfect for full body massage. May also be used daily as a skin care moisture lotion.PLEASE NOTE-Gallon Sizes are limited 4 gallons maximum per order in shipment, whether its 4 gallons of the same item or gallons of mixed products throughout the order.If you exceed the maximum of 4 gallons of the same item or mixed products per order, then the order will ship based upon weight of shipment and will have additional shipping charges that will not show up on your internet order but will be additional to your order and appear on your invoice recieved from us.This will overide our “free shipping policy over 99.00 and up. Item#-UNI-C419T.Available in a Gallon.This Hydrating Massage Lotion with shea butter, avocado, peach, and sunflower oils gives extended lasting performance while maintaining needed drag. Requires less reapplication than typical massage lotions, so you can keep continuous contact. Satiny light texture is non-greasy and suited for all modalities. Contains moisture-binding wheat amino acid and beta glucan for aid in restoring skin elasticity and hydration. pH balanced, unscented, and safe for sensitive skin.“PLEASE NOTE-Gallon Sizes are limited 4 gallons maximum per order in shipment, whether its 4 gallons of the same item or gallons of mixed products throughout the order.If you exceed the maximum of 4 gallons of the same item or mixed products per order, then the order will ship based upon weight of shipment and will have additional shipping charges that will not show up on your internet order but will be additional to your order and appear on your invoice recieved from us.This will overide our “free shipping policy over 99.00 and up.